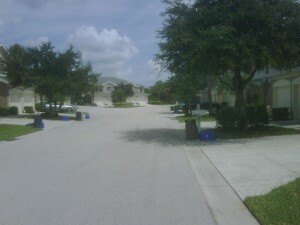 Kate and I recently visited her family in Estero, an unincorporated portion of Southwest Florida. While staying at her parents, we decided to take a walk over to the mall across US 41. 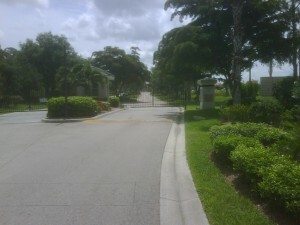 Kate’s parents live in a “gated community,” a pod of residential development connected to the transportation network by (usually) one access point that is secured by an electronically controlled gate. Now, there’s not many places to walk within the confines of the community. Most of these residential developments have a communal recreation area, typically containing a pool, tennis courts, and a clubhouse. Some, like the gated community my brother-in-law lives in, split the clubhouse in two and arranged the buildings to resemble a mini-Main Street, only about 150′ long. Due to the close proximity of the clubhouse and the cost of parking, there is usually only enough parking at the clubhouse for a few guests. 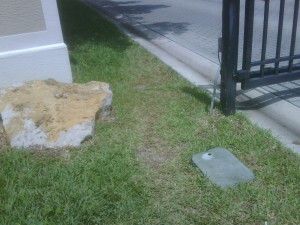 Despite this, there are no sidewalks within many of these gated communities. It’s clear that you are to walk to the clubhouse, but rely on the car for all other trips. So, back to the walk itself. You can follow along using a map of the pictures on Flickr. We leave her parents' condo and begin walking down the asphalt towards the gate. Approaching the gate. You'll notice that the gate only prevents automobile access. 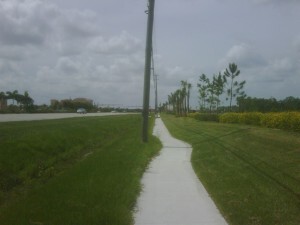 The trampled grass clearly shows the demand for pedestrian access to US 41. Now, once you make it up to US 41, you’ll find a typical (4 feet wide, plain concrete) residential sidewalk, however it’s set 10 feet from the roadway and slightly below grade. This is done because US 41 is a very wide, high speed county arterial. The majority of the retail within Lee County is on US 41. It’s the epitome of the new suburbs – all land uses carefully divided through Euclidean zoning, accessible only by car. 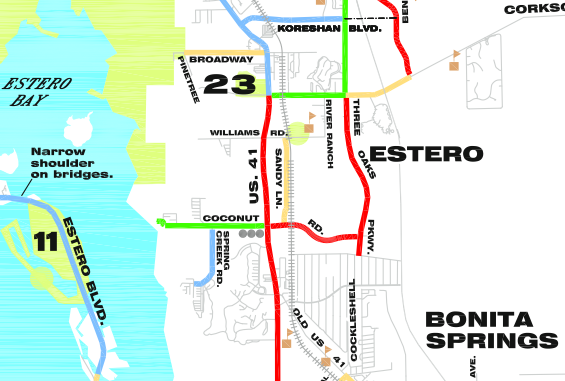 Detail of the Lee County Bike Map. Red denotes "dual facilities." The Lee County Bike Map lists this section of US 41 as having “dual [cycling] facilities,” those being a sidewalk and a paved shoulder.We did pass one person utilizing the sidewalk as a bike path. This was the only other person we saw outside of a car. Cycling makes sense – given the distance between stores and residential developments, using a bike increases your range considerably. Walking two miles (or more) might be considered ridiculous for those with access to a car, however biking two, three, five or miles in Florida can be considered recreation. Encouraging cycling to work, the convenience store, etc. would help Southwest Florida reduce VMT and congestion by getting single-occupancy vehicles off the road. Despite “dual facilities” the physical configuration of the streetscape makes all forms of travel besides the personal automobile seem dangerous and inhospitable. There’s no pedestrian oriented signage, no signal prioritization, no shade or shelter and barely adequate sidewalks and crosswalks. Cross at your own risk. The walk sign lasts about 3 seconds. The walk across at a casual but brisk pace takes around 10 seconds. The curbcuts are ADA accessible, but the timing of the light itself would cause problems for those with physical disabilities. 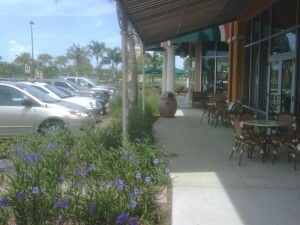 Once you cross US 41, there's no sidewalk to get into the shopping center. You're walking there? Who walks? What's wrong with you? Just like the gated community across the street, this pod of retail development is connected to the world by asphalt and accessed by car. Coconut Point does have a residential component and unfortunately Simon took down the website they had up with a great map and detailed renderings, so I can’t point to you a nice package of evidence that they thought at least some of the project through. The interior walkways throughout the “lifestyle center” are actually pretty nice. The interior walkways are wide, with a planting strip. Too bad you cannot easily get to the more friendly pedestrian pathways without a car. The single use pods of commercial residential development set a mile or two apart inhibit easy pedestrian access. 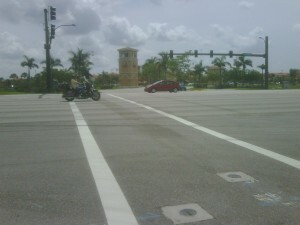 The mini-center within Coconut Point is a step in the right direction for future land development in Florida, however considering how much of the area has been built out, it will take serious planning and a change in the collective vision of Southwest Florida before we see true center-based development. 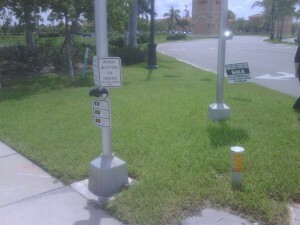 This entry was posted in Cars, Planning, Transportation and tagged design, Florida, pedestrian, Southwest Florida, walkability. Bookmark the permalink. The issue is cultural first and foremost. Our generation grew up with Queen’s “I’m in Love with My Car” and Deep Purple’s “Highway Star”. You can’t change a generation’s emotionally-ingrained ways through reasoning.